I normally read books of this genres but l also stepped outside my comfort zone with authors and genres l am so glad l did because l have read so many great books and come across some great authors. Synopsis: When Edie marries young to escape her unhappy family home she thinks that life can only get better, at the age of nineteen, she is widowed, and after losing her child from the marriage she faces the second world was grieving and lonely, then one night during the Birmingham Blitz an infant, mysteriously abandoned during the bombing, is handed in to her care. Her lively friend Ruby, meanwhile, does not want to be left behind in the wedding stakes and settles for marriage with Frank, a man much changed by war, finally there is Janet, intelligent, kind-hearted and susceptible to male charm, who is hurt desperately by an affair with a marriage man, and who assumes she will never love again. David, the child who steal's Edie's heart as she brings him up through a time none of them will ever forget, is the center of all their lives, he leads Edie through struggle and heartache to a life and love she would never have dreamed of... A spellbinding saga of three very different women whose lives become entwined by war and their work at the Cadbury's chocolate factory in Bourneville – and their love for a child. Proudly sponsored by Cadbury. This book is full of upset, joy, fight and bombing but Edie looks after a little baby who is left in the middle of a bombing and she loses a husband at a young age. Then she losses a baby to her husband and sadly she will never have another chance to carry another baby. Edie raised David for years and when he was old enough he went looking for his father and finds out he was dumped in the middle of the street when bombs was going off and Edie saved him and looked after him ever since and raised him as her own baby. Review: I found this book really easy to get in to and hard to put down once l started reading it l was sad to read that Edie lost her husband then her baby at a very young age. This book was really good but sad when Edie lost her husband at a young age then she miscarriage her baby. She has to faces the Birmingham Blitz alone without her husband and baby. She was given a baby that is mysteriously abandoned in the middle of the street when bombs are going off. Luckily the baby was found and handed in to safety. The baby was named David and Edie raised him as if he was her own baby and she loved him very much. I wondered what made David's birth family leave him in the middle of the street when there was a war going on. How can any parent leave their baby in danger I was just glad he was found safe. But he had the best upbringing his mother would have wished for and he is the child Edie dreamed of it is a dream come true for Edie. She loves David and she would never stop him looking for his father this is a very sad book but it has a very happy ending. I can not put in to words how great this book is l would tell people to read it for themselves to know how great it really is. This book is a most read and l am so glad it is on my book shelf. 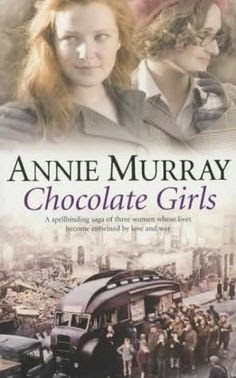 About The Author: Annie Murray was born in 1960 in Berkshire, and studied English at oxford university. Her first job took her to Birmingham where she met her husband, John. They have four children. In 1992 she began writing her first Birmingham novel, Birmingham rose, which made the times bestseller list when it was published in 1995. She has written six subsequent novels including, most recently, the highly successful chocolate girls. About The Book: this book comes with one then one book cover design and l like the picture on the front and the colours are not too bright or not too dull.